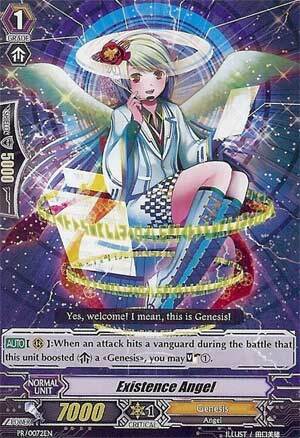 [AUTO](RC):When an attack hits a vanguard during the battle that this unit boosted a «Genesis», you may Soul Charge (1). ...in a more basic context, this is Courting Succubus/Bull's Eye, Mia, but for the newest clan out now, Genesis. For those that don't know, Genesis are very simiilar to Dark Irregulars in the sense of doing multiple Soul Charging, but what separates the two is that while Dark Irregulars keep their Soul to make powerplays, Genesis do Soul Blasts also to help benefit themselves, which will be explained easier if we ever get the chance to review more Genesis cards, but until then, let's get back onto topic with Existence Angel. She's a solid 7,000 power with the effect to where if she boosts a successful hit to the Vangaurd, then you get to Soul Charge a card. A single Soul Charge isn't very much, but if there were more of these in the backline boosting, then these can be pretty annoying as it'll help to get the Soul to a sufficient level for future plays. When building Genesis, most people ask about using our Angel friend here. Personally, if it's not an Artemis build, then most people right now are using Kushinada (Sentinel), Cumin (Alluring Succubus for Genesis), Melissa (The one where she resurrects herself when she's sent from the Soul to the Drop Zone), and Mihikarihime (The 8,000 unit), but with Existence Angel, I can definitely see people take out Mihikarihime to put these ladies in and see how it goes, so I can definitely say that it's worthy of being in the deck. Solid power and solid skill that benefits the clan definitely gives it my personal seal of approval...and to top it off, she's actually pretty cute!